This post on all about Singapore will give you brief descriptions on climate, culture, geography, business, nightlife, shopping, including facts about Singapore and much more. Also check useful links to explore more Singapore information, maps, and images. Lying almost on the equator, Singapore is not just one island but a main island with 63 surrounding islets. Singapore, officially the Republic of Singapore, is an island country off the southern tip of the Malay Peninsula, 137 kilometres (85 mi) north of the equator, in Southeast Asia. It is separated from Malaysia by the Straits of Johor to its north, and from Indonesia's Riau Islands by the Singapore Strait to its south. Singapore is the world's fourth leading financial centre and a cosmopolitan world city, playing a key role in international trade and finance. The port of Singapore is one of the five busiest ports in the world. Temperature ranges from 24o to 32o C (75-89o F) with an average daily maximum relative humidity of 84.3%. Rain falls all year round but is most abundant from November to January. The wettest months are November to January, the driest May to July. Rainfall occurs mostly as sudden showers. The good thing is: you can expect to enjoy sunshine almost the whole year round. *28°C (84°F) daytime, 23°C (76°F) at night in December and January. *32°C (90°F) daytime, 26°C (81°F) at night for the rest of the year. Singapore has a free market economy, with a stable prices, low inflation rate, and a high per capital GDP. The economy was traditionally driven by its strengths in electronics and manufacturing, oil refining and distribution, and shipbuilding and repair. Today, it is increasingly fuelled by its growing services sector. Due to its diverse population and immigrant background, Singaporean culture has often been described as a mix of cultures – British, Malay, Chinese, Indian and Peranakan. Foreigners also make up 42% of the population in Singapore and they play an important role in influencing Singaporean culture . Singapore's media sector covers broadcasting, film and video, publishing, music, online and mobile media, games and animation. As advancements in digital technology continue to shape the future of entertainment, Singapore has its eye on developing new media infrastructure and services. Singapore is, simply, a great place to do business. With a highly-skilled workforce and a regulatory environment Singapore is Hub for Business. It enjoys strong reputation as a global financial centre, with a top-rated banking system. Singapore info on living: Singapore has one of the highest living standards. Living conditions in Singapore are amongst the best in Asia with state-of-the art facilities for education, shopping, sports and recreation Daily necessities and luxuries are readily available. Favorite’s Singaporean sports include outdoor sports such as football, basketball, cricket, swimming, sailing and various indoor sports such as table tennis and badminton. About Singapore info on Infrastructure:-Singapore has world-class infrastructure and state-of-the art f acilities are well-known to the world. The famous Changi Airport, constantly ranked by travellers as the best airport. On-island transportation is a breeze with a clean, affordable and well-connected public transport system, including its Mass Rapid Transit network. Singapore communications network, top-of-the-line infrastructure links the nation to the rest of the world. Singapore is an excellent place for shopping and has over 250 shopping malls to visit. Ranging from hi-tech wares to designer wear, there is something for everyone. Famous shopping centers in Singapore are Orchard, Marina, Suntec City, Little India, Chinatown, Holland Village, Parkway Parade. After hours, Singapore practically transforms itself from an ever-so-efficient business hub to a buzzing network of bars and nightclubs. The Night Life in Singapore is very interesting and refreshing if you visit the Night Clubs in Singapore. The Night-Clubs of Singapore are some of the best spots for boozing and partying through the night. Pubbing and clubbing at Singapore is a must if you want to feel the night-pulse of the city. Getting around Singapore is effortless: the public transportation system is among the best in the world and taxis are reasonably priced. Popular tourist attractions are Singapore Zoo, Night Safari, Jurong Bird Park and the Botanical Gardens are all in the North and West. City parks full of locals jogging or doing tai chi can be found everywhere. Religion :-Buddhists, Christians, Jews, Muslims, Hindus, Sikhs, Taoists and many other religious groups. Singapore information while traveling can help you to explore the various cultural precincts, beautiful places, and religious landmarks around the island and get acquainted with Singapore’s multicultural society. Whether you join a tour or discover your own Singapore, you’ll be sure to catch a glimpse of the impressive history, cultural diversity and lifestyles of Singaporeans during your visit. It is also takes pride in its world class hotels with complete amenities that would totally give you complete comfort and relaxation. Today, Singapore is rapidly taking its place among the world’s premier global cities, where talents from all around the world gather to share innovative ideas and start new businesses. This is really helpful information about Singapore. 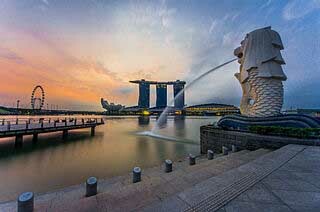 Singapore is famous for shopping, activities, dining and entertainment. Traditional festivals and holidays celebrated throughout the year adds to its cultural appeal.